The cartridge will be revealed and you simply pinch the two blue buttons to remove and install cartridges. It is not as easy to determine when the drum needs to be replaced, but a message will appear on the LCD display of the 2840 when the time comes. Unfortunately, finding the drum has proved to be a bit challenging for users. Pull that same white release lever (used to replace cartridges) to open the top panel. You should be able to locate the drum by spotting the handle. Rotate the drum so the handle is facing the top of the unit. Pull the handle and lift the drum out of the printer. Remove any packing materials, including shipping screws and orange protective plate from the new drum. Use alignment arrows to insert properly. 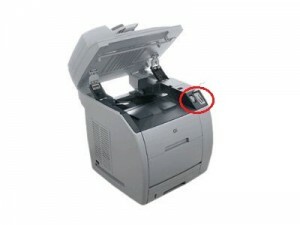 Once you have changed the cartridges and drum for the HP 2840 one time, the process should be quick and painless. It is just that first replacement that seems to stump many people. Want to rotate the carousel without having to have the top cover closed or even having the machine turned on? This is no different than the manual instructions for finding the drum. Can you provide a video or pictures on how to get the drum out? I can see where the drum is, but it doesn’t rotate & I’m afraid to break it if i force it to pull up or to rotate. I am sorry but we don’t have the printer in our warehouse and do not have access to a video that shows the process. The drum removes by pulling up on the Green handle. As you start to pull the cartridge will slightly rotate away from you as it glides along the rails in the printer. The Green plastic arrows are used to show what side is up on the drum unit. Please grasp in between the 2 arrows on the Green part of the drum unit. It should slide out with little or no force. Please feel to contact us if you have further questions. Thank you, your video was exceptionally helpful. I had issues replacing a magenta cartridge and then was trying to work out how to free the carousel. Excellent article. Mark, we are glad you found it helpful, and thanks for taking the time to comment!